For the past decade, China has faced an extremely sharp rise in property prices and increasingly large investments made in this sector. 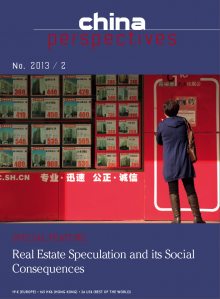 Although some economists consider this change to be no more than the result of the increase in urban salaries that has gone hand-in-hand with China’s strong economic growth, this article will show that it is in fact a “property bubble” resulting from the speculative activities of certain economic agents operating in this sector. Local authorities play a major role in this, especially in their efforts to increase their income, and their behaviour needs to be analysed in order to better understand that a bursting of this bubble might expose economic problems of a far deeper structural nature than those usually identified. The acceleration of urban expansion has greatly impacted the study of China’s urban system, and the urban function at the national level has largely been characterised by the spatial distribution and evolution of cities. In order to understand the dynamics of urban development in China, it is necessary to analyse the history of city evolution and understand the context in which that evolution took place. The first section of this paper introduces the urbanisation process in China since the 1950s in order to demonstrate the origins of China’s recenturbanisation patterns. Subsequently, the structural transitions of city scaling and urban clusters are presented by employing Rank-size Analysis and satellite imagery, followed by the challenges brought about by these changes. Finally, the spatial distribution and transition patterns of China’s urban system are analysed using Centrographic Analysis. Over the past two decades, global market finance has taken root in China to seek property investment. This article examines the spatialities and anchorage methods of finance capital within Chinese national territory. It highlights the spatial and sectoral differences in the composition of property portfolios as a function of the return/risk coupling. These differences are exacerbated by a split in the geographical origin of the funds, which determines differentiated conditions of access to land and management of the investment time horizon of the assets portfolios. The penetration of finance capital into urban space tends to increase the fragmentation and functional specialisation of districts, a phenomenon fostered by entrepreneurial urban policies. As a result, urban projects are becoming standardised in terms of both design and program. They are increasingly governed by external references that favour the expansion of multinationals and transform lifestyles and consumer habits. Commodity housing has become a major engine of urban restructuring and social change in China. It is alleged to aid growing residential segregation and urban fragmentation. In this context, housing price is viewed as an important sorting mechanism. This article investigates this claim by looking at Guangzhou’s housing market and analysing data of 797 commercial housing estates. It analyses the development of commodity housing and the trends of housing prices in the city and maps the locational patterns of high, middle, or low housing affordability within this sector. China has rapidly developed a sophisticated regionalism strategy in East Asia. Minimising the region’s “China threat” perception has been a significant consideration in this strategy. Unfortunately, the ongoing escalation of tension concerning territorial disputes over the Diaoyutai / Senkaku Islands and the South China Sea, initiated by a series of high-profile naval exercises in the latter half of 2010, has reinforced the “China threat” perception and bolstered the hedging strategies of countries in the region. China is aware of its relative disadvantage, and it has been keeping its options open while allowing ASEAN to maintain the initiative.